Tonight I saw Mark Bingham at the Hi Ho Lounge (for the AnxSnd Holiday blow out show) and he mentioned that an Ed Sanders CD that he produced (and I played on a few tracks of) was listed as the top poetry CD of 2007 on About.com. I thought that was interesting, then he mentioned that a Davis Rogan disc is also on the list. I am also on the Davis CD. I am on two of the top poetry CDs of 2007 according to About.com. Will I suddenly become rich and famous, or even rich or famous? I have noticed that the amount of music I am making is inversely proportional to the amount of time I spend writing here. I guess it is good that I haven’t written much lately, because that means I have been playing a lot. On December 9th, I spent a very eventful 18 hours in Chicago. BoX3 played the Ears and Eyes Festival, and it was a blast. The festival also provided me the opportunity to hear Zing! and Matt Ulery’s Loom. I have already commented on the Zing! CD, and I picked up a copy of the Matt Ulery’s Loom disc “Music Box Ballerina”, and the James Davis Quintet’s “Angles of Refraction” at the fest. There may be more comments on these CDs later. Later that night I heard Aram Shelton at the Hungry Brain. The first set was solo Aram with alto sax and laptop. He did a nice job of integrating the two and having it make some sense, which can be very difficult. The second set was Aram with Josh Berman on cornet, Jeff Parker on guitar, Jason Roebke on bass, and Frank Rosaly on drums. They sounded great. I had had a long day and Dan was pouring quickly, so I can’t offer too many specifics, but it was an enjoyable listen, and good to see and hear some friends that I don’t get to see or hear often enough. Every year on December 26th, George Porter, Jr. has a birthday gig at The Howlin Wolf. This year it was quite a production in honor of George’s 60th year. A Who’s Who of New Orleans music was in attendance, and it seemed like half of them showed up on stage at some point. The Runnin’ Pardner horn section joined PBS for a few tunes from the new CD. At one point I looked over and Ivan Neville had jumped on the vacant B3 that was stage left, and Stanton Moore was on the second drumset. Johnny Vidacovich played, as did Raymond Weber. At one point later, Russell left his drums and went to the B3 and Stanton and Raymond were left at the two drumsets. It was a fun jam, and most of it was pretty musical. George is a special cat, and it was nice to be able to be part of acknowledging that on his 60th birthday. The following very eloquent statement from Richard Kamins caught my attention. I don’t have much to add, it was just so well said, that I wanted to do my share to see that it is read by as many people as possible. I am sure this is making the rounds, but I just saw it this morning (thanks to jw). Have a Merry Christmas, Happy Holidays, Crazy Cool Kwanzaa, I hope you had a Happy Hannukah, and please have a great anything else that I may have missed. It is a hand numbered limited run of 200 copies. I’ll be in Chicago this Sunday (9 Dec) with BoX3 at the Ears and Eyes Festival. 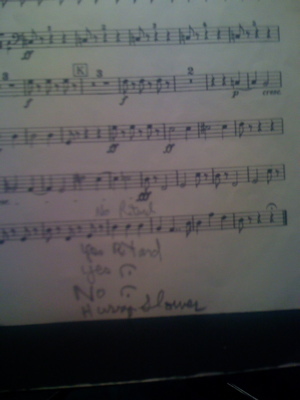 I found these notes on my part to the Nutcracker. It came off beautifully in performance.